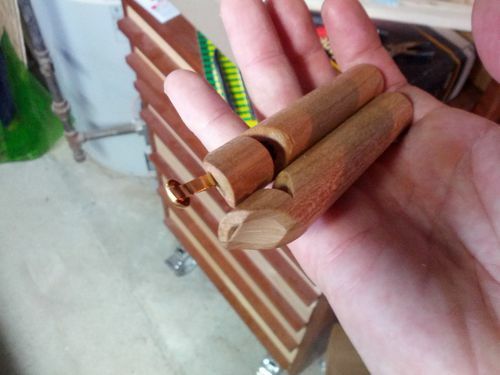 I wanted to make a whistle for quite some time now, but just never gotten to it. I also knew I would like to involve my daughter in the making of… which worked out great! 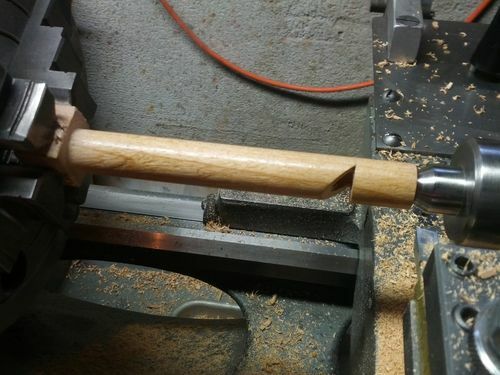 I had previously turned some maple to ~3/8” that I will use as the insert (will be discussed shortly). 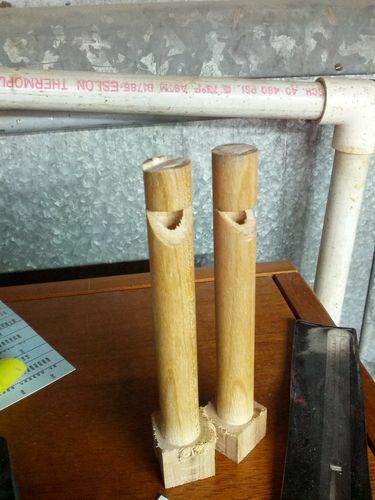 you could turn some material, or just get a hardwood dowel (make/buy) of a known size. Based on this size you should drill the hole. This is where the magic happens. 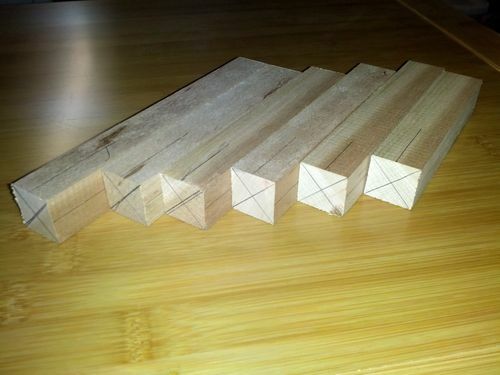 an angled cut and material removed creates a chamber where air circulates and create a vortex of which one side effect is the production of sound – a whistle! 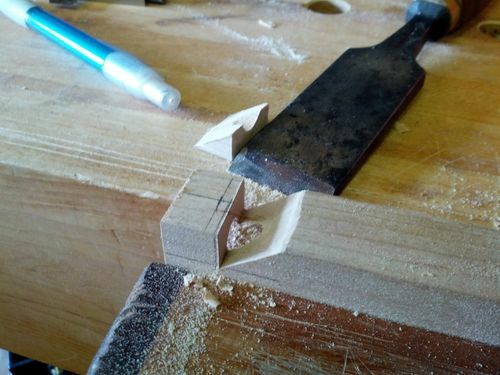 Other than the previously cut chamber, this is the 2nd part making the magic. the insert. 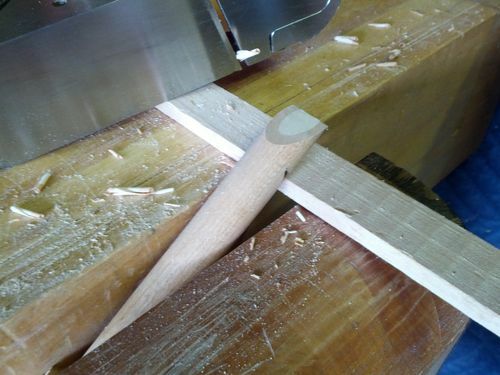 the insert will block most of the mouth opening, and allow only a narrow passage of air into the chamber which in turn will circulate to make the tune. In addition to the depth of the hole drilled in step #2, how much material you remove from the insert also affects the tone of the whistle, the more you take off, the lower the tone of the whistle will be, but don’t be shy – if you don’t take enough material, your whistle might just not make a sound at all… in my case, I took off too-little material off and one whistle is currently finicky. you might be able to see that one insert has a much narrower opening than the other, and while it produces a higher tone when I tested it, after gluing it in – the opening got smaller (glue and wood expanded) – small enough so that not enough air passed through, and no sound comes out… :/ so make sure you open it large enough to avoid this. 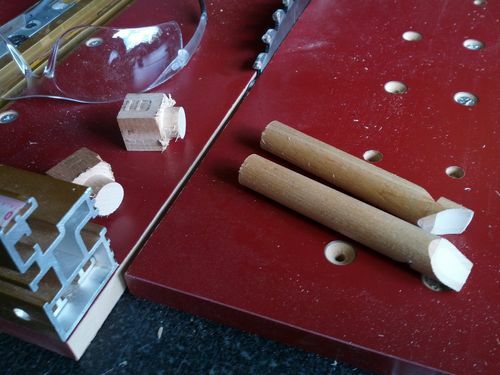 Tip: the closer you turn it to the internal hole, and the thinner wall material the whistle will have, the better the sound it will resonate, but the more delicate it will be. 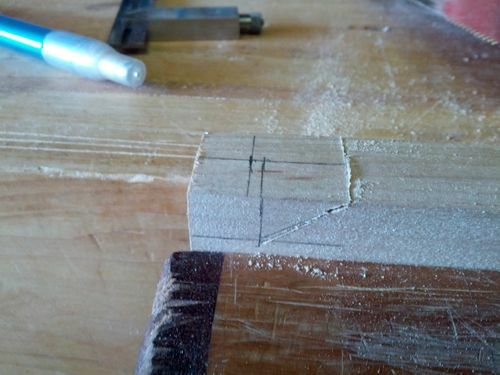 this is planing diagonal to the grain, so while it’s not as hard as planing end grain, it’s also not as smooth as planing with the grain – so take light passes not to tear up the whistle at this point (almost done). 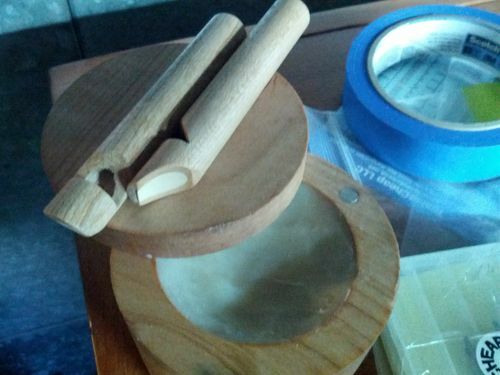 I simply used beeswax for this as it is food safe, and well… you’ll be using it in a similar manner. As you can see I tried to clean up the air opening in one whistle as the flat I made was just too narrow. I ran around the house not able to find anything that would fit in there until I came upon a paper pin that did the trick. the only problem is that this will clear the whistle for a few seconds, but then the fibers will rise again blocking the opening… just have to open it up some more next time around. Very cool, Sharon. 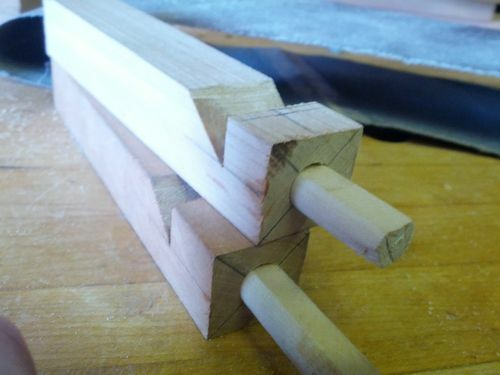 I love the part about indoctrinating… er… teaching your daughter about woodworking! We need more women woodworkers on the site. Very nice Sharon: And how much did your daughter do? Even I could turn such an object. I hope I get to try it out soon. 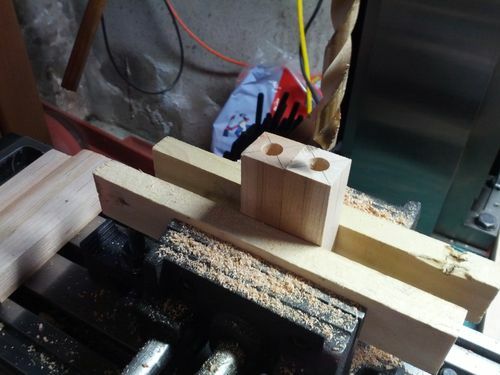 Karson – my daughter did everything but the saw cuts (make initial blocks, cutting wedge, and trimming the ends once complete), that included drilling the holes, making the flat on the insert, turning the whistle, and planing the mouth shape… and of course using it. Great post Purp. I love getting ideas for things to make with the kids. Great blog! Thanks for sharing your expertise. Added to my favorites for future reference, sounds like something fun to do with my grandchild due to arrive Oct. 30! made a fistful of these with my 6 yr old couple weeks ago. he enjoyed the process. I also set him up with some birdhouse “kits” . after posting the birdhouses on facebook he was contacted for his first ever commission. so far he has sold 3. he has a whole laundry list of his next projects. we also started putting together his toolbox . I would have never thought a 6 yr old would be so excited to start collecting tools. Excellent blog and a great project. 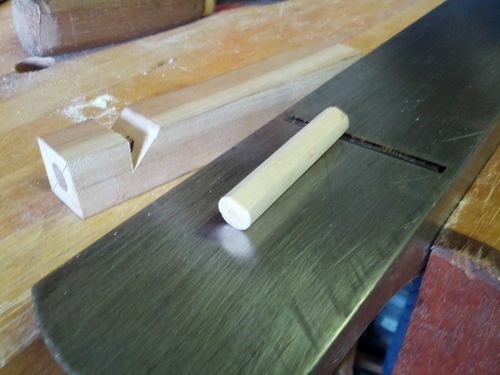 A few of years back I made some two toned train whistles and made a little pdf on the process. Sharon, I hope you don’t mind my piggybacking on your blog, but this is obviously whistle central on LumberJocks. Cool. I still want to make some of these. This is another reminder to do the things I want to do. Douglas – no worries about piggybacking on this – the more the merrier. thanks for the link! John – sounds like a great time with your 6 yr old – quite amazing seeing them so excited, and enthusiastic about making things isn’t it?